Arsene Wenger claimed his first win in fourteen tries against Jose Mourinho when his Arsenal squad beat Mourinho’s Chelsea in the Community Shield thanks to Alex Oxlade-Chamberlain’s first half strike. While Mourinho will be quick to downplay the loss as one that occurred in a glorified friendly in August, there were a few issues present, especially on the offensive side of the ball, that might hinder Chelsea in the long run. There’s no better way to put this: Chelsea is probably the worst big team in Europe when they are down 1-0. When Chelsea are forced to attack (and especially if the other team doesn’t want to entertain them by playing, as was the case against Arsenal), Chelsea’s offense dies. This isn’t solely a hallmark of Mourinho’s Chelsea, as he had this happen to him at Madrid a few times as well. The difference between this Chelsea and that Madrid is that, for one, that Madrid had a lot more offensive firepower than this Chelsea. At least, firepower that Mourinho was willing to use back then. Take Chelsea’s substitutions in this match. While Falcao for Remy was a straight swap, subbing Cesar Azpilicueta (who will be referred to as Dave, from now on) off for top five football human Kurt Happy Zouma and then Terry for Victor Moses weren’t exactly going to part the Arsenal defense, which was VERY good. The only substitution that sort of made sense was Oscar for Ramires. Chelsea’s overly defensive midfield was having trouble getting the ball to Eden Hazard, who truth be told wasn’t having the best of games, and Loic Remy, who started for the injured Diego Costa. At least Oscar’s substitution – if only for a limited period of time – put some life into that Chelsea attack. Cesc moved back into the back two of the midfield, where he was getting the ball sooner and was therefore able to start attacks a little faster, but both Remy and Falcao aren’t Diego Costa, so Chelsea was forced to rely on Hazard too much, and Eden couldn’t deliver. It’s not like Chelsea theoretically doesn’t have options to combat that stagnation. It’s just that, for whatever reason, Mourinho is reluctant to go to them. (You get the feeling that Mourinho would rather lose 1-0 than risk it and somehow ship a few other goals in stoppage time.) 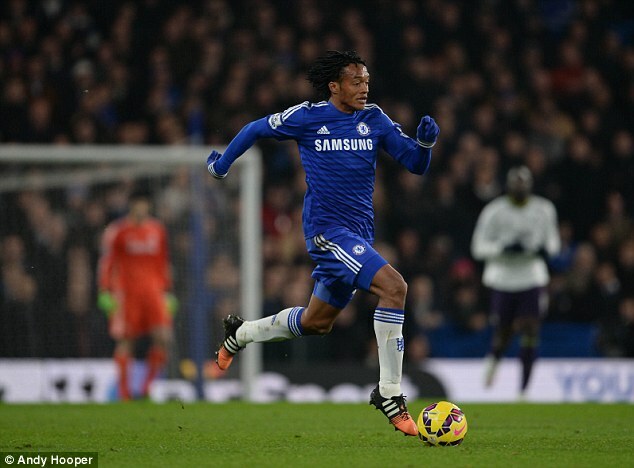 He could have went to Juan Cuadrado, the Colombian winger Chelsea bought in January presumably to combat this problem. But that Juanny C was shackled as soon as he got to Chelsea, with Mourinho sapping him of his offensive verve and remolding him into another Willian (one who doesn’t play half as much). Granted, nothing I’m saying here is groundbreaking. These are all things Chelsea struggled with last season. Their offense is one dimensional and they rely too often on opponents taking the game to them, allowing them to counter attack with ferociousness. When Chelsea are doing that, they’re very good (albeit still a level below the top teams in Europe). However, when Chelsea are robbed of counter attacking opportunities, when teams give them space a little farther away from goal, they wither away and die. The game stalls, and all too often there’s a sense of waiting for something that will probably in all likelihood never happen. Mourinho and company stay waiting for the goal (my second Sam Beckett reference on the blog). And much like they did in the Community Shield, the Blues will find that a very fruitless exercise. This entry was posted in English Premier League and tagged Cesc Fabregas, Chelsea, Diego Costa, Eden Hazard, Jose Mourinho. Bookmark the permalink.